A multi faceted installation consisting of museum archive material and original artwork, documented and invented narrative, observer participation, locally site specific relevance, ceramic sculpture; it is love story and tragedy, something for everyone. The installation has been widely appreciated by the residents of Sevenoaks, including some from W G Hicks’ family. Teacher, Headmaster, Scout Leader, he has himself no direct descendants. 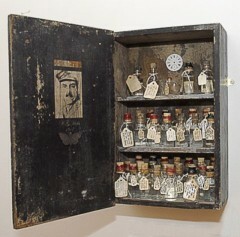 The installation’s objects constitute a nexus uniting past and present through threads of local Sevenoaks connections, facts and fictions, contemporary art and historical archive. Lieut. W.G. Hicks died in France in July 1917, at Barlin, and was one of 262 men from Sevenoaks to die in the war. The notions of memorial and restoration run through the installation, both in the ‘real’, historically grounded artefacts, and the lives as imagined by Jane Churchill. 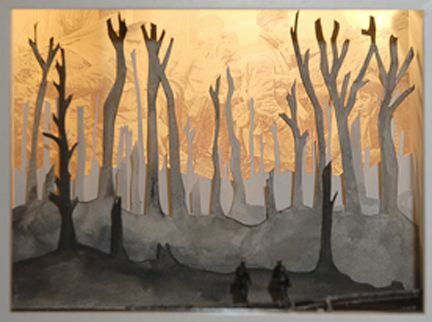 A series of 17 backlit boxes depict WG Hicks’ imagined return to his fiancé. A fictitious letter has Jesse wishing “….to create a better ending for him than the one he had to face…” Hicks is granted a happy ending. In another series of fading images made in Jessie Ellman’s name by the artist, there is a romanticism that perhaps belies the pain – viewed from a distance of nearly a century, we might as poet Edward Thomas (also killed, this time by the shockwaves of a passing shell, at Arras in April 1917, and who by coincidence lived near Sevenoaks.) writes, in ‘Early One Morning’ find that ‘The past is the only dead thing that smells sweet’ and in such sweetness we avoid the harrow. In the absence of actual memory there are only “Surviving Objects” We who have no memory of the real events are obliged to imagine, to use our imagination, to put ourselves in the place of others. Our collective memory resides in waves of emotional resonance flowing from life to life over generations, carried unwittingly in the minutiae of everyday behaviour, but which, like the Chinese whisper, can emerge with message distorted. We need reminding. The whisper that is heard as happy ending began its journey in suffering that has passed but remains real. The moth stands as metaphor for the fragility of the living dead. Rows of symbolic moths in museum cabinets, wings bearing battlefield maps, or wartime photographs, bring together time and place, event and consequence. One cabinet displays moths with human bodies, pinned in place, specimens and comrades, they rest in cases as soldiers in war graves, (man and moth equally subject to a higher power?) etched with a laser engraving machine whose creation of a vaporising surface heat points to the symbiosis of destruction and creativity and chars their wings. A pair of large wall mounted cabinets displays collages, in one of letters and in the other images, perversely obscured by what remains of the card from which ranks of moth – shaped holes are cut. Shades of sentiment and sentimentality tint the installation. There seems to be implicit at the heart of sentimentality an attendant cruelty. But such cruelty is not actually buried deep, as we fondly imagine, to be called upon as a last resort. but is present on the surface, in the grain of things, immediate. W G Hicks’ uniform, bought as it was from his own pocket, was returned to his family. “It left little doubt as to the extent of his wounds and the manner of his death. The shock was very great for his mother, two sisters and father.” The pity of it all lies in the matter of factness and ease of cruelty.